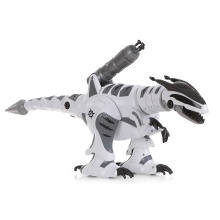 K9 Intelligent Dinosaur with exquisite craftsmanship, excellent appearance and perfect quality has multiple functions, such as Programmable, Touch-sense, Shake head, Shake Tail, Dancing with music and patrol, Shoot bullet. It assists and accompany kids to explore so much fun. With those amazing functions, K9 Dinosaur will be welcomed among children and provide unprecedented delight for children. Come on, this is a perfect gift and company. Touch-control: By touching the head of the dinosaur, it will start with simple interaction with you. More functions: the dinosaur also can spin the head and tail, very interesting.